With the rapid progress on site of the infrastructure and the onset of cooler weather we will be prefabricating as much as possible in the shop and then transport it to the job for installation. We are literally building a mountain around the building in the center of the property. A few days ago we started on the top portion which will be perched up on the roof. The steel fabricator built us a steel structure that is to fit perfectly on the roof. Our task is to make this structure look more like a Giggle Ridge mountain. It will feature a giant mother tree, a counterpart to the old man tree over at the golf next door. Here's a picture of that tree which we built almost fourteen years ago. It all started with a concept drawing. There are bound to be plenty of changes from this concept drawing by the time the project is complete but this drawing set the tone and style of the piece from the start. As the building ideas came together the architect drew up the draft plans which I then got to comment on and modify as necessary to make it all work and look like it should when we are done. 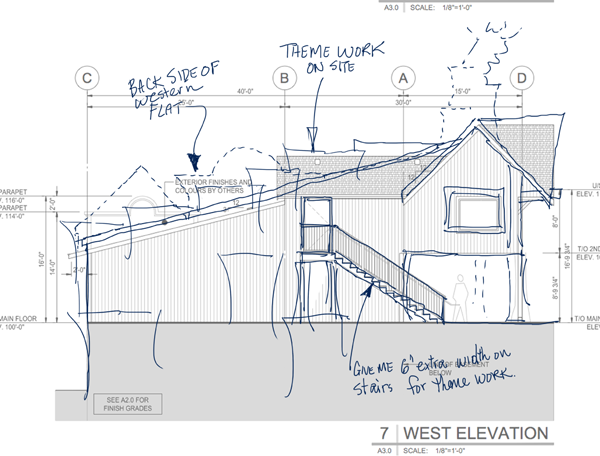 The architect then redrew the plans to fit into the theme work we envisioned. We will undoubtably make a few more changes as we begin to build as this is the nature of this kind of work. Once we had the final plans in hand I drew up a scaled sketch of the structural steel I would need. The engineer then looked it over and spec'd the sizes and welding details for the structural steel which was then fabricated and delivered to us at our shop. The top portion (between 'A' and 'D') is to be built in two pieces. Both pieces currently rest on custom made structural steel stands which are engineered to safely and securely hold them for construction and transport. Today I finished the welding of the bottom framework. It's almost as large as the bottom of the lighthouse base and will be a spectacular lift when it is hoisted to it's final resting place high above the park.